Start Planning Earthquake Survival or Perish. Smart Earthquake Survival Starts With You! It’s no secret that major earthquakes are on the increase, and if you look at this list below of major quakes over 6.0 on the Richter scale just in the last few weeks, you will definitely start putting earthquake survival plans in place.Its not a matter of if…but when and where the next earthquake is going to strike without any warning! Sensible people living in earthquake prone locations should have emergency preparedness plans in place, because in the event of major earthquakes you will more likely than have no electricity, water supplies, access to food stores, and communication and transport will be severely compromised. Build your survival gear and work out evacuation plans carefully with no need to panic and rush out to stock up on all the wrong survival gear and emergency foods. Read all the guides about survival and learn exactly what you need as a foundation in survival items and build it out from there until you are satisfied. In the aftermath of a major earthquake or any disaster for that matter, your earthquake survival plans will come into play allowing you to survive until services are restored and emergency personnel can rescue stranded individuals. What Happens During and After Earthquakes? Huge destruction, chaos and panic are normal during a heavy earthquake and shortly afterwards criminals and opportunists take advantage of the chaos and limited looting, and burglarizing wherever they can. They know that law and order are stretched to the limit and will go on the rampage with little respect for life and property. Your earthquake survival kit should have a weapon of self defense for keeping you and your family safe plus supplies of foods, drinkable water and emergency medical supplies to treat injuries. Wise survival preppers make plans to have storage of supplies at two locations or more because you never really know what areas are going to be badly affected causing limited access. Many natural disasters can be tracked and warnings can be broadcast to the public through the media but where it concerns earthquakes they come when it is least expected during the day or at night which is worse, and when the ground starts moving there is little to do except wait it out. This means earthquake survival planning should be done right now so that you are always prepped and ready for any catastrophe of this nature. There is no warning system for earthquakes yet, so we know when it’s happening only when the ground starts moving. And, while there are areas more prone to earthquakes (the West Coast is particularly unstable) they can really happen anywhere. In order to be ready for an earthquake, you have to be ready all the time. Lie flat under a table or study bench, or any suitable cover where nothing will fall on you, and remain there until the tremors have past. If there is no cover sit against a sturdy wall where there are no objects that can fall on you. Do not move around or panic during the earthquake, but stay still until the shaking has passed. When everything is still, check whether you have any injuries, and that others around you are also safe. Beware of aftershocks so stay close to your safe area in case these happen because they can sometimes be severe as the main quake. After the main earthquake has passed check for fires, compromised gas pipes, water and electricity dangers and turn off main switches if possible. If you need evacuate the building should you be at work walk slowly and carefully taking the stairs to leave the building, or emergency exits whatever is clear. Should you be outdoors during the earthquake move away from trees, buildings, walls, power lines and street lights crouching down and protecting your head until you can reach a safe spot. Assist others especially those that are injured and have physical disabilities once the earthquake has subsided and proceed to the emergency evacuation point which should be clearly shown in all workplaces. It is best to have earthquake survival plans and evacuation drills in place using foresight so that you and your family know what must be done after this disaster. If you live in an earthquake prone country it is not a matter of if but when the next earthquake is going to happen so don’t put off planning survival. Lastly: Always have alternative locations where you will have access to survival gear and supplies. 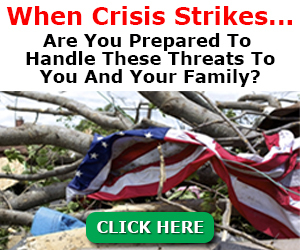 Browse this website to get everything you need to survive any types of disasters and start proper planning today! Next Hurricane Emergency Preparedness: Before…During …and Aftermath!